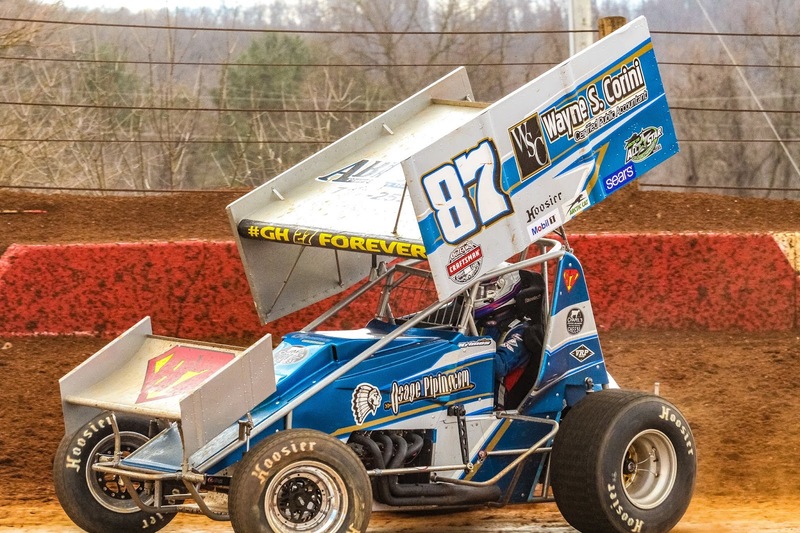 Abbottstown, PA (March 23, 2019) – After being shut out of victory lane for over two years Alan Krimes said it felt like forever since he’d been there. Krimes found himself in victory lane for the first time since September 3, 2016 on Saturday night. Krimes shared the front row with pole-sitter, Cole Young. Krimes got out in front of Young when the green flag dropped with Tim Glatfelter right behind him taking over the second position. Brian Montieth was up to fourth from his sixth starting spot and started to work on Young for third. Krimes started to pull away from the field and when the caution flag came out on lap 7 for Trey Hivner in turns 3 and 4 it erased Krimes’ 2.6 second lead. Brandon Rahmer flipped on the back stretch on the restart bringing out the red flag. Glatfelter tried the bottom in turns 1 and 2, but Krimes held onto the lead on the restart. Krimes had amassed a 1.4 second in only two laps. Montieth moved into third after Young pulled into the infield on lap 9. Krimes had a 2 second lead as he caught the tail-end of the field on lap 15. The caution came out on lap 19 for Danny Dietrich and Chase Dietz in turn 4. Dietz was able to rejoin the field, but last week’s winner, Dietrich, headed back to the pits, ending his night. The late caution played to Krimes’ advantage as he was approaching a lapped car that was running his line around the track when the caution came out. If Krimes struggled to get around the lapped car it would have given Glatfelter the opportunity to reel him. Glatfelter once again tried the bottom of turns 1 and 2 on the restart and once again Krimes held onto the lead by running the top of the track. The caution came out one last time on lap 23 for Freddie Rahmer as he stopped in turn 2 with a flat tire. Rahmer had been running sixth. Krimes held off Glatfelter one last time on the final restart to earn his 19th win at Lincoln. Glatfelter was second with Montieth holding onto third. Adam Wilt finished fourth and Chad Trout completed the top five. 410 Sprint Car heat winners were Glenndon Forsythe and Alan Krimes. Fresh off his 2018 track championship, Troy Wagaman found himself in victory lane for the 358 season opener. Wagaman started on the front row with pole-sitter Cody Fletcher. Third-place starter, Kevin Knouse, got a good jump on the start and made a move for the lead, but Wagaman held on to pace the field until the caution came out before the first lap could be completed. Zach Euculano, Zachary Allman and Austin Treuchet got together in turns 1 and 2 bringing out the caution. Mark Van Vorst pulled in during the caution with no brakes. Allman rejoined the field after changing his flat tire within the allotted two minutes. Wagaman got out to the lead again on the complete restart when the red flag came out for an incident in turn 2. Dalton Dietrich, David Holbrook, Zach Euculano and Jeff Halligan were involved with Halligan landing on the side of this car. Holbrook, Dietrich and Van Vorst rejoined the field for the restart. Knouse got under Fletcher in turn 1 to take second on the restart with Wagaman holding on the lead. The second red flag of the race came on lap 1 for Holbrook, Allman and Treuchet. This time it was Holbrook who ended up on his side. Treuchet, Allman and Holbrook rejoined the field for the single-file restart. Wagaman and Knouse both went to the top of the track in turns 1 and 2 on the restart. Wagaman had checked out from the rest of the field and had a 1.6 second lead when the caution came out on lap 4 for Treuchet who came to a stop in turn 2. Wagaman and Knouse went high again on the restart with Fletcher trying the bottom. Troy and Kevin pulled away from the field as Cody and Tyler Ross battled for third. Once Ross got by Fletcher for third on lap 9, he started to reel in Knouse. Meanwhile Knouse was closing the gap between him and Wagaman. Wagaman put a lapped car between him and Knouse with 2 laps to go which one would think sealed the deal for Troy. The caution came out with one lap to go for Holbrook as he hit the wall in turns 1 and 2 setting up the field for a one lap shoot out. Knouse tried the bottom in turns 1 and 2 on the restart before the red flag came out one last time for Brett Strickler as he flipped in turn 2. This time Knouse tried the high side in turns 1 and 2 and stays with Wagaman down the back stretch. Knouse pulled a slide job on Wagaman in turns 3 and 4 and nearly made it stick. Knouse gave it everything he had as he raced Wagaman to the checkered flag. Wagaman beat Knouse to the flag stand by .056 seconds. Ross crossed the line third. Matt Findley was fourth and Cody Fletcher finished fifth. 358 Sprint heats were won by Matt Findley and Alyson Dietz. Next Saturday, March 30, Lincoln Speedway is back in action with 410 & 358 Sprint Cars. Racing starts at 6PM with pit gates opening at 3:30PM and grandstand gates opening at 4PM.